Editor’s note: The following account is excerpted and adapted from the author’s new book, Sword and Scimitar: Fourteen Centuries of War between Islam and the West. Exactly 1,300 years ago, in the year 718, a little remembered kingdom was born in and led to the liberation of Spain from Islamic occupation. Such terrorism was intentionally cultivated, in keeping with the Koran (3:151, 8:12, etc.). For instance, the invaders slaughtered, cooked, and pretended to eat Christian captives, while releasing others who, horrified, fled and “informed the people of Andalus [Spain] that the Muslims feed on human flesh,” thereby “contributing in no small degree to increase the panic of the infidels,” wrote al-Maqqari, another Muslim chronicler. In the end, native Spaniards had two choices: acquiesce to Muslim rule or “flee to the mountains, where they risked hunger and various forms of death,” according to an early Christian chronicler. 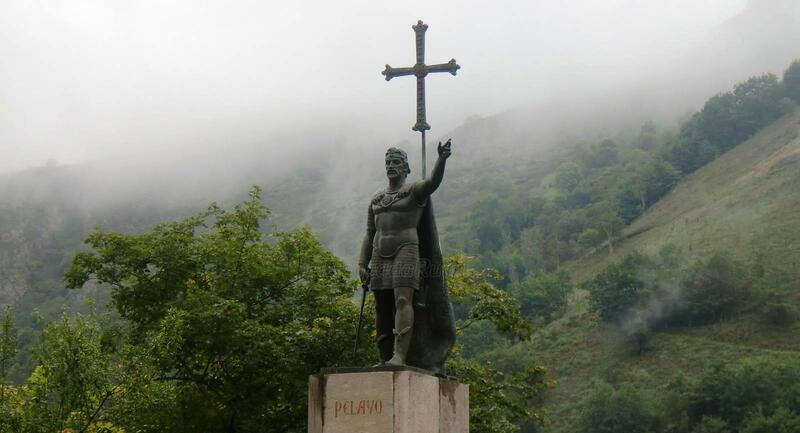 There, in the deepest recesses of the Asturian mountains — the only free spot left in the Iberian Peninsula — the assembled Christian fugitives declared Pelayo to be their new king. Thus the Kingdom of Asturias was born in 718. To keep the [northern] Christians in their place it did not suffice to surround them with a zone of famine and destruction. It was necessary also to go and sow terror and massacre among them. Twice a year, in spring and autumn, an army sallied forth from Córdoba to go and raid the Christians, destroy their villages, their fortified posts, their monasteries and their churches, except when it was a question of expeditions of larger scope, involving sieges and pitched battles. In cases of simply punitive expeditions, the soldiers of the Caliph confined themselves to destroying harvests and cutting down trees. . . . If one bears in mind that this brigandage was almost continual, and that this fury of destruction and extermination was regarded as a work of piety — it was a holy war against infidels — it is not surprising that whole regions of Spain should have been made irremediably sterile. This was one of the capital causes of the deforestation from which the Peninsula still suffers. With what savage satisfaction and in what pious accents do the Arab annalists tell us of those at least biennial raids. A typical phrase for praising the devotion of a Caliph is this: “He penetrated into Christian territory, where he wrought devastation, devoted himself to pillage, and took prisoners.” . . . At the same time as they were devastated, whole regions were depopulated. . . . The prolonged presence of the Muslims, therefore, was a calamity for this unhappy country of Spain. By their system of continual raids they kept her for centuries in a condition of brigandage and devastation. Even so, the mustard seed would not perish. “A vital spark was still alive,” Edward Gibbon wrote; “some invincible fugitives preferred a life of poverty and freedom in the Asturian valleys; the hardy mountaineers repulsed the slaves of the caliph.” Moreover, “all who were dissatisfied with Moorish dominion, all who clung to the hope of a Christian revival, all who detested Mahomet,” were drawn to the life of poverty and freedom, as 19th-century historian Henry Edward Watts put it. By the mid eighth century, the “vital spark” had spread to engulf the entire northwest of the Peninsula. Over the next three centuries, a number of Christian kingdoms — Galicia, Leon, Castile, Navarre, Aragon, and Catalonia, whose significance and names morphed and changed with the vicissitudes of history — evolved from or alongside the Asturian mustard seed. They made slow but steady progress against the forces of Islam. Finally, in 1085, and after nearly 400 years of Muslim occupation, the Christians recaptured the ancient Visigothic capital, Toledo. Over the next century, not one but two massive new invasions came from Africa, the first under the Almoravids, the second under the Almohads. Both were committed to the jihad (in ways that would make the Islamic State appear half-hearted). A tug of war between Christians and Muslims ensued until 1212, when the two forces met at the highly decisive battle of Las Navas de Tolosa. Victory went to the Christians: One by one, long-held Muslim cities were liberated by the victors: Córdoba, for centuries the capital of Muslim Spain, in 1236; Valencia in 1238; and Seville in 1248. Only the remote Muslim kingdom of Granada, at the very southern tip of the Peninsula, remained. Surrounded by mountainous terrain and with the sea behind it, Granada was well fortified, inaccessible, and isolated from the rest of Iberia. Moreover, Christian infighting habitually flared out, as Castile, Aragon, and Portugal increasingly jockeyed for power. On Christmas Day in 1481, Granadan Muslims stormed a nearby Christian fortress and slaughtered all present. King Ferdinand and Queen Isabella declared war, so that “Christendom might be delivered from this continued threat at the gates,” as they explained, and “these infidels of the kingdom of Granada [might be] ejected and expelled from Spain” once and for all. After a decade of military campaigns and sieges, Granada finally surrendered, on January 2, 1492. “After so much labor, expense, death, and shedding of blood,” sang the monarchs, “this kingdom of Granada, which was occupied for over seven hundred and eighty years by the infidels,” had been liberated. And it all came to pass thanks to Pelayo’s Asturian mustard seed, planted 1,300 years ago this year.